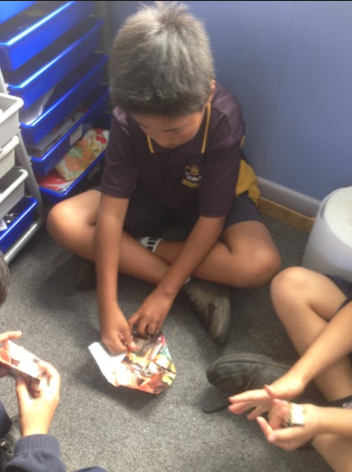 WALT: Learning from each other and learning with each other. 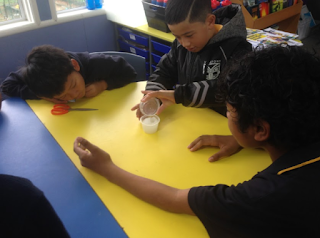 Yesterday on Wednesday we had Tuakana Teina day in Room three. We were making earthquake houses to test. But first we had to go over all the rules in a group. Then we had to watch a video of a earthquake house getting tested with no materials then with materials after. Before we made our earthquake houses we had to plan what materials we are going to use to improve our houses. We had to record ourselves explaining our planning. Then we had to build it. With doors and windows. After that people chose to paint it. Furthermore after you have built it you have to put materials on our earthquake houses to make it ready to get tested by Miss Gormly’s phone on an app. In addition it got tested and we had to record it well it’s getting tested from Miss Gormly’s phone on the app and we made sure that there is a cardboard our earthquake house. I will no cause harm to others and only practise boxing in a safe environment under the guidance of a coach. In boxing we were very hot from working physically. Our hands were very sweaty from wearing the enormous boxing gloves. I would like to learn more boxing skills. Pax made it fun. is a type of science ingredient. We used it for chemistry. warning notes and a little drawing in the conner. Finally The polymer absorbed and then rose up like a muffin. I was shocked because it felt like cotton candy. Firstly we had to listen to Ms Braceys instructions to follow. She tore pages out of a magazine. She gave us a page along with scissors. the piece of paper into lots of pieces of triangles. Our fingers were very busy folding. also use it for a crown or a lion claw but you can use it for anything you want.